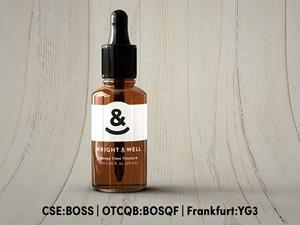 VANCOUVER, British Columbia, March 21, 2019 (GLOBE NEWSWIRE) — The Yield Growth Corp. (CSE:BOSS) (OTCQB:BOSQF) (Frankfurt:YG3) is pleased to announce its new cannabis wellness brand, Wright & Well, will be launching in Oregon. The products are intended to help relieve pain and anxiety, and will be sold through a distribution network of 400 retail cannabis stores. The initial nine products include THC and CBD oils, analgesic topical gel with THC and CBD, pain balm with THC and CBD, massage oil with THC and CBD, and three types of capsules containing THC and Ayurvedic herbal formulations, blended with ingredients that have historically been used to treat arthritis and chronic pain. Wright & Well branded products will be launching in the legal cannabis market in Oregon, and will serve the growing number of wellness-minded people seeking new ways to take control of their health. Sophisticated, familiar and intelligent, the new brand aims to demystify the world of cannabis and make it more accessible for a wider audience. Yield Growth worked with an expert branding agency over several months to position the new brand. Wright & Well invites users to experience a sense of freedom—by looking and feeling their best, and by deciding to purchase from a brand designed especially for them. Familiar, sophisticated and thoughtful, the name is a homonym: when spoken, it is “Right and Well,” which evokes the idea of proper and healthy. “Wright” means “a maker of,” so Wright & Well also means “a maker of health.” The brand intentionally stands out from the others in this space, and is designed to cultivate affinity with a new, savvy group of consumers, making the decision to purchase an easy one. “Wright & Well will appeal to people who are a step ahead in finding health solutions that are right for them,” says Bhavna Solecki, Director of Product & Content at Urban Juve. “The products will stand out in the marketplace because they are the first to use our patent-pending hemp root oil. Hemp root oil complements and enhances our products with therapeutic healing compounds that provide superior transdermal absorption due to the unique terpene profile.” Wright & Well products are formulated with proprietary formulas using carefully selected cannabis strains, and the pain balm, topical gel and massage oil contain hemp root oil. The Yield Growth Corp. intends to disrupt the wellness market, which is a $4.2 Trillion Global Economy according to the Global Wellness Institute, by connecting ancient healing with modern science, and harnessing the power of hemp- and cannabis-infused products. It is a vertically integrated asset company with the leadership, financial position and science-backed formulas to capitalize on the cannabis revolution. The Yield Growth management team has deep experience with global brands including Johnson & Johnson, Procter & Gamble, M·A·C Cosmetics, Skechers, Best Buy, Aritzia, Coca-Cola and Pepsi Corporation. Yield Growth serves mainstream luxury consumers who seek sophisticated wellness products. Its flagship consumer brand, Urban Juve, has registered 35 products with Health Canada and has signed 70 retail locations to sell its products. Key ingredients in these products include Cannabis Sativa hemp seed oil and hemp root oil, created using Urban Juve’s proprietary, patent-pending extraction technology. Urban Juve has also filed 11 provisional patents in the United States. Through its subsidiaries, Yield Growth is commercializing over 70 wellness and cosmetic products and has multiple revenue streams including licensing, incubation services and product sales. Wright & Well products include THC and CBD oils, an analgesic topical gel, pain balm, massage oil and three types of capsules containing THC and Ayurvedic herbal formulations. The Yield Growth Corp. is a diverse team of business executives dedicated to rapid, sustainable financial growth for businesses with viable models for success.